Relaxation is the foundation that supports good digestion, strong immunity, stable mental health, sustained meditation, balanced yoga, a good nights sleep and healthy relationships and yet, it is surprisingly scarce in our daily lives. I’m going to share a little bit more about how relaxation supports 3 of these areas and offer you some easy tips to try out. I’ve found many people think relaxation means having a glass of wine, watching TV or maybe doing both simultaneously. There is nothing wrong with these unwinding techniques, but they do not give you the same healing benefits you get from conscious relaxation. Conscious relaxation means that you are experiencing the release of tension without distraction in the mind. You are completely present with the experience on a physical and emotional level. So how do you practice conscious relaxation? I certainly didn’t know until I started doing yoga. The hook that drew me into becoming a lifelong yogi happened at the end of my practice, during shavasana – the ‘relaxing’ part of yoga. Interestingly it was not something I gained during that time, but something that I lost. When I tried yoga in my early 20s, I was more interested in getting a good workout and didn’t have the patience for what I perceived as “hanging out” in seemingly rudimentary poses. But, later, in my 30’s, I found myself drawn to yoga again. This time, I noticed something very peculiar. It was after the physical exertion of the asanas ended and the teacher skillfully guided us into releasing all effort by laying down in the corpse pose. Just lying there, I noticed something was missing. I wasn’t even sure what disappeared, but it felt nice. Really nice. So I went back the next week and sure enough, when I went into corpse pose, something was missing once again. And so I kept going back again and again because this feeling was very very compelling. What I began to realize was that, in those 5 or so minutes, a pervasive experience, that I previously thought was an innate part of me, was absent. When I noticed the feeling returning after the class, I was able to identify it. It was a low level feeling of nervous anxiety that was so familiar–so pervasive that I never even noticed it at all. That is, till it went AWOL–at least for a few minutes during shavasana. Something I had always thought was an innate part of me, something that seemed part of my DNA, wasn’t actually me at all, but a condition of deeply ingrained learned behavior. 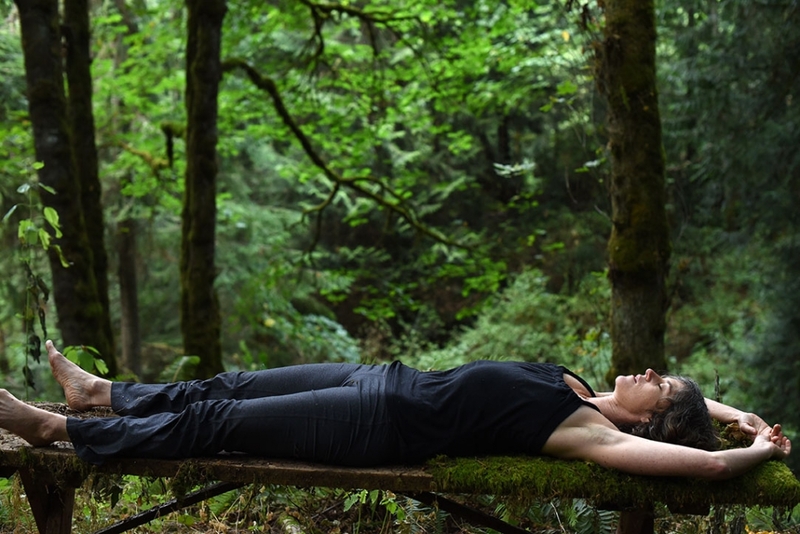 And in those minutes of shavasana when the nervous anxiety subsided, there was relief and I finally felt a realtime undistracted experience of relaxation. It was intoxicating and I knew that this was just a small taste. I sensed that this feeling of ease actually stretched out infinitely in potential and I had just stumbled upon the doorway. Fortunately I was able to learn what relaxation feels like through yoga, but what has become strikingly clear to me since, is the fundamental importance of relaxation to every aspect of well-being. In Ayurveda, we stress the importance of strong digestion. We learn about eating in season, proper food combining, using the 6 tastes and honoring our constitution. However, before we put anything into our bodies, we must first be relaxed in order for digestion to work well. If we are stressed, hurried or emotional while we eat, the sympathetic nervous system will be activated, sending our energetic resources away from the digestive process and into the muscles, heart and blood stream readied for that emergency response. The stress-fighting hormones cause us to crave sugar and what’s more, we know that stress diminishes the crucial diversity of our gut micro-biome. We are really just starting to understand the intricate connection between the brain, gut, hormones and immunity. Before eating, put your hands lovingly on your belly and take 3 deep breaths, moving the belly into your hands on the inhale. Relax the belly completely as you exhale. This will promote relaxation for good digestion. Another core teaching of Ayurveda is that the body is intelligent and self-healing. We know that this intelligence works best when the body and mind are relaxed, because one of the key changes from the parasympathetic response is that the arteries dilate. This space in the vessels allows for good flow in the body. Everything is dependent on that– from the movement of nutrients, proteins, antibodies and hormones in and out of cells to digestive elimination and the removal of toxins out of the body. A deeper breath also moves lymph–our super protective immune fluid. This is key because unlike the closed circulatory system being pumped by the heart, the lymphatic system depends on deep breathing and movement to pump its fluid throughout the body. Conversely, the opposite is true as well–that stress and the restriction of flow in the arteries can create imbalance in the body and prolong any existing illness. Lie on your back comfortably. Take a few deep breaths, releasing the body into the earth. You will slowly imagine moving up the body, relaxing each area as you pass through. As you visualize a certain body part, imagine breathing right into that part of the body, releasing any tension as you exhale. Start at the feet. Visualize breathing into the feet, relaxing completely on the exhale. You can add the mantra, “feet relax.” Slowly move up the body, Deep breath, “legs relax.” Deep breath into the hips, “hips relax” and so on making sure to include the belly, chest, back and arms. Then, moving up through the neck and face. Go through the head slowly including the jaw, mouth, nose eyes and forehead. Finish by focusing back down at the center of the chest, relaxing the heart. Imagine relaxed blood being pumped out to every cell of the body bathing yourself in a flow of ease. You would think that meditation would be an easy way to ‘relax’. However, for those new to meditation, it is common to feel frustrated and disheartened by the practice. You may be trying too hard to make the mind stop or become a certain way. The cause of this frustration stems from being unable to reach a subtle, or not so subtle, goal of attaining an idyllic, peaceful state of mind. Actually, it serves the practice of meditation much better if we start with a relaxed attitude. In other words, we allow the mind and body to be exactly how they are naturally and learn to observe and watch it from that state of ease. If the mind thinks, it is not a problem. It is the mind’s nature to think. We just allow these thoughts to come and go without getting involved in them and over time this gentle state of watching creates a settled calm through the process itself. Take a few minutes at the beginning of your meditation practice to relax the body by taking several deep breaths, releasing any tension on the exhale and dropping into the experience of breathing. Throughout the meditation practice, remind yourself often, “whatever is happening is natural.” Thoughts, emotions, sensations, sounds are all coming and going naturally as a result of previous conditions. When you notice tension anywhere in the body, relax into the breath again. As a former stress case, I know it’s not enough to just tell ourselves, “relax.” First we have to know HOW to relax! This state of ease has to become consciously familiar and known to us. So along with the relaxation tips above, find your relaxation portal. Is it in shavasana, a restorative yoga pose, in a hot shower or bath, walking the dog or drinking a cup of tea? When does a noticeable level of ease enter your being? When do you actually feel the delicious melting away of tension, stress, and anxiety? Try to notice the conditions that lead you to feeling relaxed. What are the circumstances? What is the environment like? Repeat those conditions and really tune into the experience. Once you have identified the best conditions for you in experiencing this yummy state, you can give yourself a 10 minute relaxation break every day. You may feel like a rebellious American in taking this time, but it is more than OK. It is healthy and super smart. Go ahead: Take a deep breath. Let go of all the “doing” for a moment. Take another deep breath. Enjoy the simple gift of being alive.